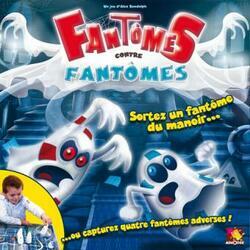 Two teams, each with four good ghosts (blue) and four bad ghosts (red), compete against each other. But so that your opponent doesn't know who is who, the ghost colors are secret! In turn, move one of your ghosts one square. If you have moved a ghost to a square containing an opposing spectrum, capture it! There are 3 ways to win: capture four good opposing ghosts, get one of your good ghosts out of the mansion, or have your opponent capture your four bad ghosts. Contents of the box : 1 board, 16 ghosts, (8 ghosts with blue marker, 8 with red marker), 1 rule booklet.